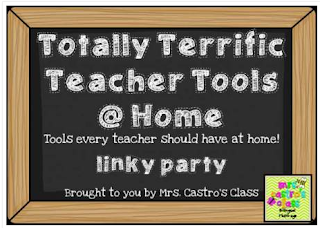 Mrs. Castro is having a Totally Terrific Teacher Tools at Home linky (say that 3x fast)! 1. My Mac with an extra screen. I love, love, love my Mac and would convince anyone to get one instead of a PC. It allows for so much more creativity! My husband hates it. He's a computer guy and would much rather have a PC. Having the double screen is a huge help! It makes creating things for my classroom so much easier. 2. Okay, I just got this and haven't even opened it yet (look for a post in the near future). But I have a feeling I'm going to be making a lot of classroom books with this one! I already have a project ready to go - my new calendar from Charity over at The Organized Classroom Blog! 3. My drawers. In here, I have printer paper, card stock, labels, business cards, photo paper, etc all organized. I use all these things in my classroom all the time so it's nice to have it separated but all in one easy place to access. I also just (finally) organized my closet - doesn't it look great?! 4. I guess I should add my HP All-In-One to this list. 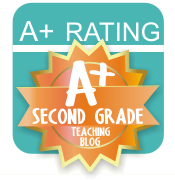 I use it to make all my labels, center activities, classroom posters. I also go through ink kinda fast. Maybe I should dial it done a bit? Now, one teacher tool that I would like to have at home? Definitely a laminator! I have an Amazon giftcard so I think I'm going to take the plunge before summer ends! Oh, I would love a book binder! 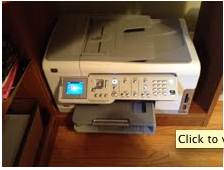 You should definitely get the laminator...I did a few weeks ago and its does a great job! 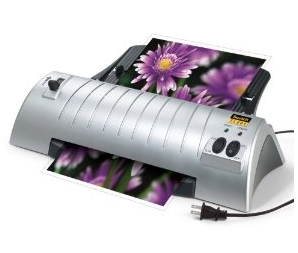 I have that exact laminator, and I love it! I definitely recommend it! Thanks for linking up! I am beyond jealous of your computer! I didn't share mine because it's a lame laptop...I'm dying for a mac! Someday...and I can't wait to see all you do with your book binder. I want to know if its worth it. AND that's the laminator my dad's work lends me - and it's amazing! I can't function without my MacbookPro, either! Love, love, love it! I'm following your blog! Resources look great - quite a creativity station you've got!!! I'm Not Crafty...but I Monday Made It!